‘Everywhere else’, is an imaginative written piece written in response to ‘Ausland’, a show at the DomoBaal Gallery, London, 2003. The essay explores questions of belonging and exploration in the art works of Jan Peters, Martina Schmid, Silke Schatz, as well as the places in which the works were commissioned, and the sites they inhabit in the domestic as well as the institutional space of the gallery. Each of the three artists included in the exhibition works with forms of architectural and spatial representation – Martina Schmid produces foreboding mountainous landscapes on folded paper from doodles scribbled while daydreaming, Silke Schatz draws large scale architectural perspectives of places she remembers in fine coloured pencil, while Jan Peters works in video presenting narratives of his experiences in labyrinthine buildings. I described the spaces materially present and those places I imagined the artist might have encountered in producing their work. The text was written as a detailed empirical account, moving between the art works and the sites they referred to, as well as the location of the gallery itself. My critical intention was to question the constitution of a legitimate subject or object for art criticism, and to expand the possibilities of criticism by suggesting that the critic could move beyond the works themselves to discuss the sites imagined or remembered by the artists and the sites of their economic exchange. 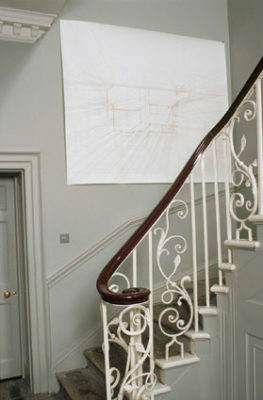 The building in which the Domo Baal Gallery is located, a Georgian terraced house in Bloomsbury, London, is also the curator’s home. As a critic you have access to the administration spaces or rooms ‘supporting’ the gallery’ and also to the private and domestic rooms of the house where art works often on ‘show’ in the gallery are to be found in a very different setting. The essay was published as ‘Everywhere else’, catalogue essay for artists Jan Peters, Martina Schmid, Silke Schatz, Domo Baal Gallery, London (October 2003).